Around 2PM on Saturday, We sat together for having a lunch, the husband got a call from his friend. It was an invite for us to visit the Golu that is been set up in his house. We planned to go his home that day evening. But unexpectedly the roads were empty and shops were shut due to the conviction of political on that day. So, to be on safer side, we planned to go for the golu the next day. Late in the evening yesterday, we went to the Golu. We have been offered by the welcome drink and then some homemade snacks. I always fascinated to see the Golu and few interesting themes every year, starting from the chettiyar and his shop to the god and goddess idols kept in the top most rack. I like to keep Golu, but since I don't aware of the customs and rituals to be followed, there was a bit hesitation to do it. On top of it, it is really difficult to set up golu every year, do pooja consistently being in a full time job. Things apart, I limited myself just by visiting golu and temples nearby during the navarathiri days. The golu visit do not complete without a thamboolam(a gift bag) which consist of prasadam and some gifts. The prasadam is something which they prepare everyday to offer god as neivedhyam. 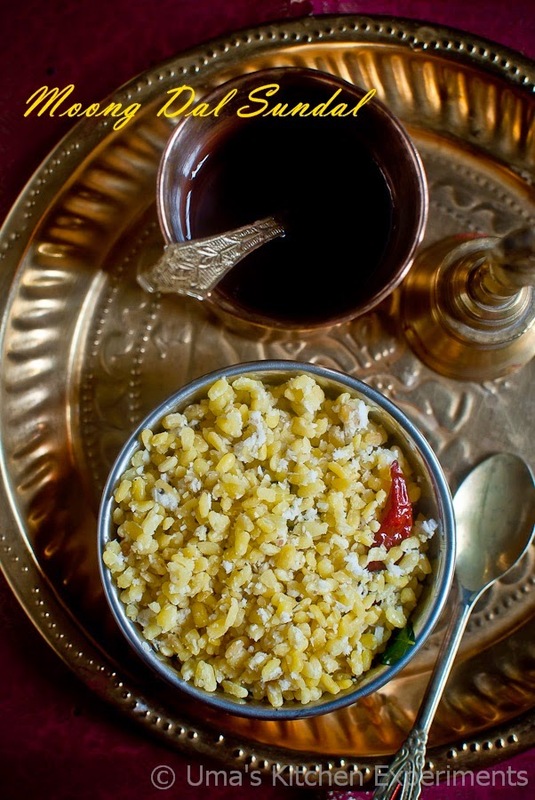 Sundal which is synonymous with navarathiri, make an entry atleast for a day among nine days. Unlike other sundal recipes, Moong dal sundal doesn't require a soaking time and you can make it in no time. Only thing you need to concentrate on it is not to over cook or under cook it. Just do the seasoning and offer god. 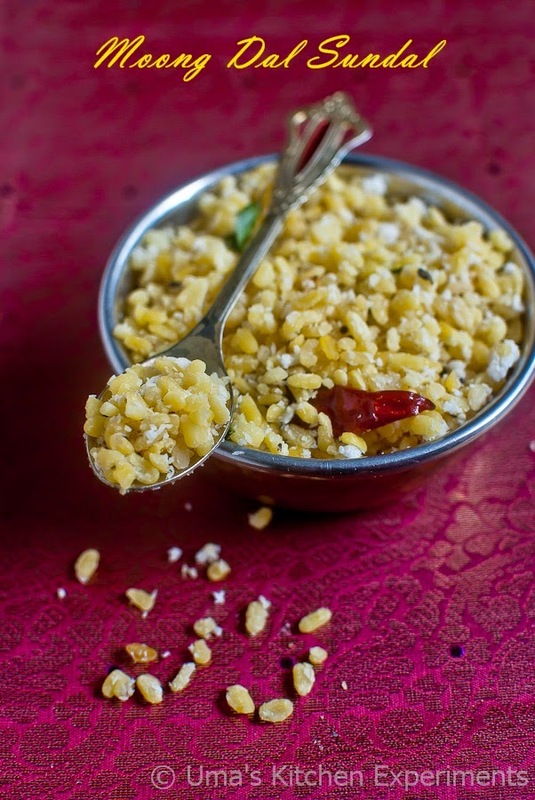 I personally like to add some grated fresh raw mango with this sundal for the light tartness. Try it! 1) Dry roast the yellow moong dal till it slightly changes in its colour (it shouldn't be brown) and release nice aroma. I generally roast it before storing it in jars every month after buying it. 2) Boil 3 cups of water in a big saucepan. Allow to roll boil. 3) When it is roll boiling, reduce the flame to low and add the roasted yellow moong dal and salt. Make sure to reduce the flame, otherwise the water starts boil over when you add moong dal. 4) Remove the foam that form on the top of the water using ladle and discard it. 5) Allow the moong dal to cook for 5 minutes. Based on the moongdal quality the cooking time varies. It took exactly 5 minutes for me. Make sure not to overcook or undercook it. 6) Drain the water using a colander. Let the dal be in colander for few minutes to drain out the water completely. 7) Meanwhile, take another pan and heat oil in it. 8) Add mustard seeds and allow it to splutter. 9) Add curry leaves, green chilli and dry red chillies. Stir and for dew seconds. 10) Reduce the flame. Pat the sides of the colender by your hand to separate the moongdal grains. Add to the pan and gently stir it. 11) Finally add grated fresh coconut. 12) Mix well and serve warm. 1) Cooking the moongdal correct is the tricky part here. So stir gently and watch out the time properly. 2) You can also soak moong dal for some time for quick cooking. Without soaking it took just 5 minutes for me to cook it. I used roasted moong dal for cooking this sundal. Make sure to roast the moong dal, otherwise it becomes mushy quickly. 3) Use slit greenchilli instead of finely chopped, if you don't like to have spicy moong dal sundal. 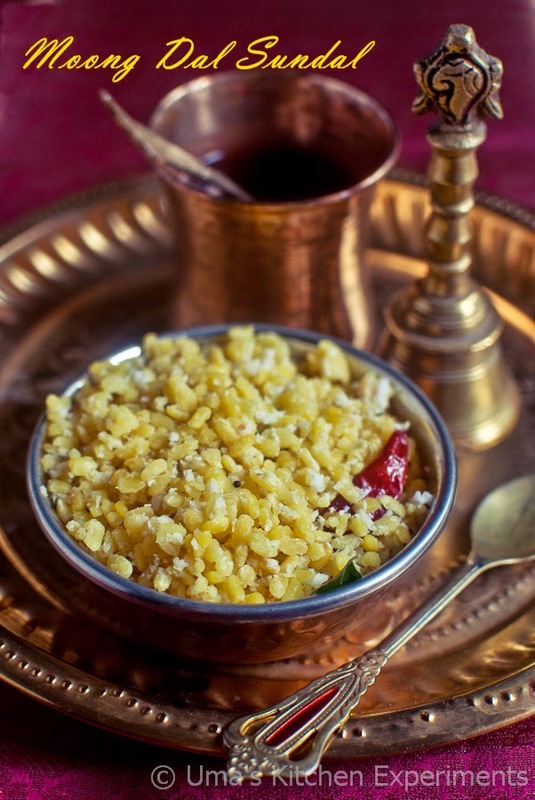 lovely moong daal sundal, love it!! 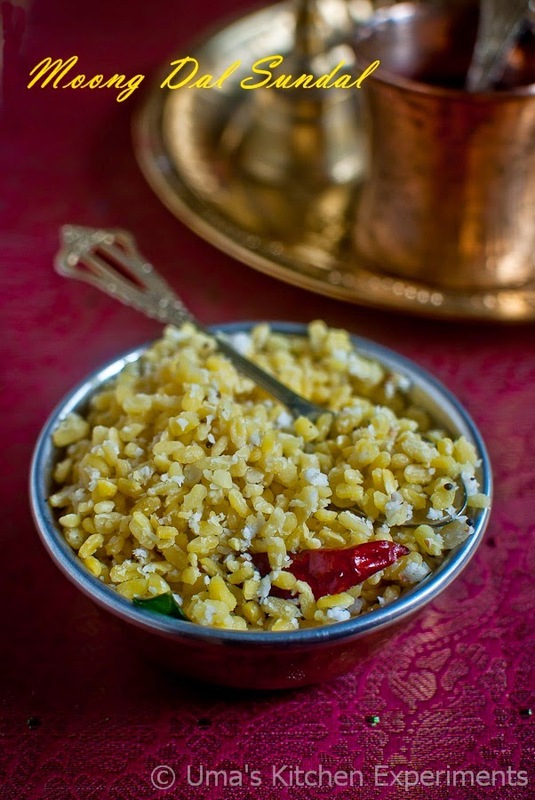 Nutritious sundal, looks delicious and healthy. Reminds me of prasadam being served in a kovil Uma. The pics are too good. Sundal looks absolutely gorgeous .